What to look for when buying dog food for Great Danes? What dog food for Great Dane puppies? Best dog food for senior Great Danes? Best wet dog food for Great Danes? 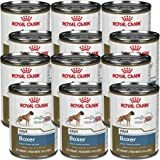 Best dry dog food for Great Danes? The Great Dane is the world’s largest dog breed, and quite an impressive sight in most situations! They resemble large and goofy horses, and they are surprisingly fun loving, active and playful for a dog with their proportions. The owner of a Great Dane can be sure to laugh daily for as long as they are fortunate enough to have the dog with them, and few can resist that big and adorable Great Dane face once it is placed on your lap with begging eyes looking up at you. It is not unusual for this gentle giant to beg to have their dinner served like this, and nutrition is incredibly important in order for the breed to live long and healthy lives. Looking for something old-school? 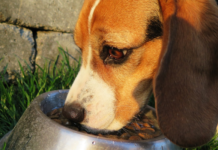 Try these Freeze Dried dog foods. So, what is the best dog food for a Great Dane? What do Great Danes eat, and how much food should a Great Dane eat? So many questions, which – luckily – have simple answers. When browsing for the best food for Great Danes, you are likely to stumble upon this large breed formula for dogs over the age of 7. Great Dane food products need to meet high standards due to the impressive size of the dog breed, and while all dogs need extra care as they reach a more advanced age – the Great Dane needs even more care to make sure their bodies remain strong enough to support their own weight. 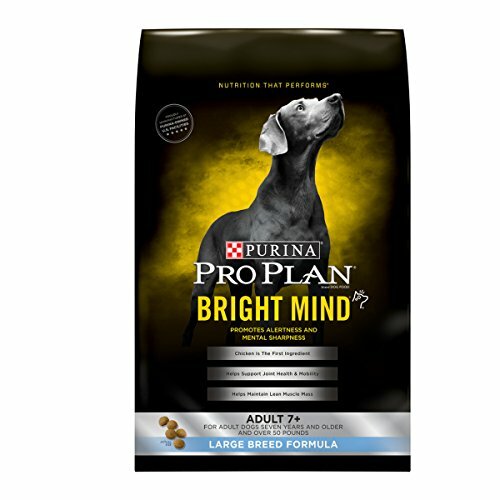 Purina Pro Plan’s senior formula has botanical oils for a sharp mind and alertness, it has real chicken as its first ingredient, EPA (an Omega 3 fatty acid) and Glucosamine to promote healthy joints and bones, and it is rich in antioxidants and vitamin B. Why We Like It – This senior Great Dane diet contains nutrients that can help a large body stay strong for as long as possible, and it is easy to create a Great Dane feeding chart by following the feeding instructions on the back of the bag. Big dogs weigh a lot, and weight puts a strain on both bones and joints! It is because of this that proper nutrition is extremely important for large dogs like the Great Dane and this product fulfills all the requirements of a contender for the title of ‘Best Food for a Great Dane’. It uses natural ingredients such as deboned chicken, brown rice and wholesome grains to create a unique recipe suitable for large dogs all ages. Big dogs benefit from the Glucosamine and the Chondroitin – added to aid in keeping bones and joints in shape – and the LifeSource Bits found among the kibble are packed with antioxidants, vitamins, and minerals (chosen and recommended by dog nutrition specialists and holistic veterinarians). This nutritious mix aids in strengthening the immune system and to fulfill life stage requirements. Why We Like It – When feeding a Great Dane, it is essential to look for a high protein content and ingredients that aid in bone and joint health, such as Glucosamine and Chondroitin. 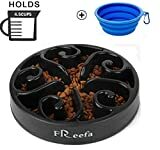 This kibble has proper Great Dane nutrition and is delicious enough to have even the pickiest Great Danes eating as they have never eaten before. For more foods in the price range, see our review on the best affordable dog food options. 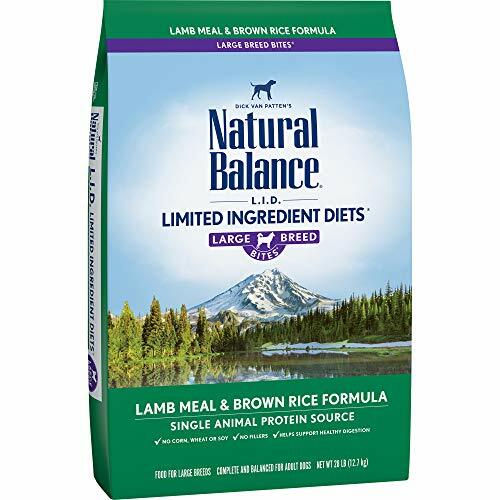 If you are on the hunt for the best dog food for Great Danes with sensitive stomachs – a limited ingredient kibble like this Natural Balance variety might be the right choice. It is made with a single animal protein source, which limits the ingredients that a food sensitive dog is exposed to, and it has no unnecessary fillers, corn, wheat or soy. The kibble helps promote a healthy metabolism and weight (because while a fat Great Dane might seem cute and all – excess weight is devastating for a large dog’s bones and joints), the size of the kibble is just right to keep a big dog’s teeth and gum clean and healthy and it is made with lamb which tends to be popular among hungry canines. There is also calcium and Omega 3 and 6, as well as a unique blend of vitamins and minerals. Why We Like It – This dog food for Great Dane family members is made to suit a big dog’s nutritional needs and is gentle on sensitive stomachs thanks to its single protein source – lamb. If you worry about how much to feed a Great Dane – especially when trying to watch their weight – the instructions are provided on the back of the bag. When you are looking at what- and how much to feed a Great Dane puppy, or a Great Dane adult (or when wondering how much do Great Danes eat), it is easy to get lost in a sea of products promising a million things. 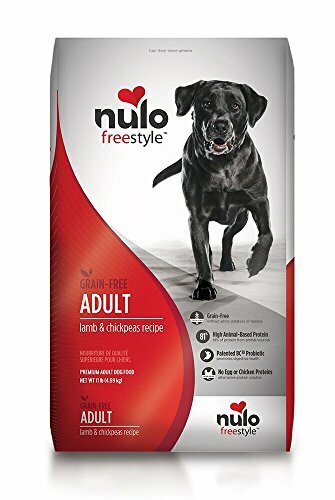 Nulo keeps it simple with their 100% natural kibble; rich in protein and vitamins, and without any fillers, artificial preservatives, grains or wheat. 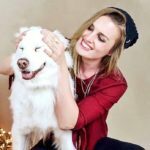 You can choose between lamb, salmon, and turkey, and the brand has deliberately left out chicken and egg since some dogs don’t tend to digest them that well. The food is made in carefully controlled factories in the United States, and there are no funky or strange ingredients listed. For a Great Dane eating healthy is crucial, and this crunchy and nutritional kibble provides them with the energy they need throughout their adult years. Why We Like It – If you have other dogs too besides your Great Dane, this food is a great option since it works well for both big and small dogs, and you won’t have to buy several different products when trying to meet the nutritional needs of your furry family members. When it comes to senior Great Dane feeding, it becomes even more important to choose the best Great Dane food you can find, since their bones and joints are very sensitive due to their weight. Many older dogs suffer from arthritis and joint pain, and a dog as heavy as this massive canine is at an even greater risk, and it is essential to first know what to feed a Great Dane puppy, and then, as they grow older, know what to feed a senior. This kibble has added Glucosamine and Chondroitin for bone and joint health, and while the body produces this naturally – the production slows down as the dog grows older, and a supplement in their diet goes a long way to promote a pain-free and long life. It is grain free, full of protein from real meat (trout and other meat sources), has no artificial colors, flavors or preservatives and it aims to resemble a dog’s ancestral diet. Why We Like It – This is a mild Great Dane dog food with natural ingredients and plenty of delicious protein. 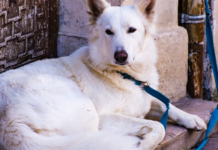 The Glucosamine and Chondroitin are great for bone and joint health, which may otherwise become an issue in older dogs, especially in large breeds. Great Danes need proper care and nutrition from that they are little since their bones and joints have a lot of growing to do during the first months and years of their lives. When feeding a Great Dane puppy, you want a dog food that is full of protein, essential vitamins and minerals, and other ingredients to promote healthy growth. This Great Dane Puppy food (which also comes in an adult variety) is packed with protein-rich deboned chicken, chicken meal, fish meal and eggs, providing all the protein they need to grow big and strong at a healthy rate. To balance out the protein content, the kibble also has vegetables and fruit, the fatty acids ARA and DHA to support retinal function and cognitive learning (also found in the mom’s milk), patented LifeSource Bits with vitamins, minerals, and antioxidants for a strengthened immune system and an irresistible meaty flavor. For Great Dane puppies, diet control is an important step in providing them with what they need to stay happy and energetic, and this product makes it easy to provide properly for their nutritional needs. Why We Like It – Have you ever wondered how much should a Great Dane puppy eat? Don’t worry! 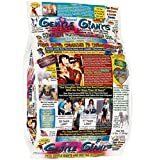 The product has a practical Great Dane puppy feeding chart printed on the bag (just look at the puppy weight that corresponds with the weight of your fur baby), which makes it easy to know how much to feed throughout the puppy months. Remember to weigh your pup regularly to ensure you are feeding him or her the right quantity. This wet dog food for Great Danes is a great option for that big fella that isn’t too fond of kibble. 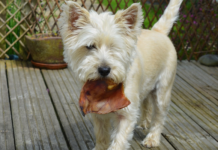 It can be given on its own or mixed in with dry food to make it more appealing. It is perhaps the best dog food for Great Danes that are fuzzy eaters, or for those that might have trouble chewing, either due to old age or gum disease. Blue Buffalo’s canned dog food is made with real turkey – a high-quality protein source – and a healthy mix of easily digestible potatoes, fruit, and other vegetables, and it is completely free from dairy, soy, corn, wheat, and eggs. Due to this, it is a good answer to the question of what to feed a Great Dane with food allergies, since it is mild on the stomach, helps boost the immune system follows the guidelines for what would be considered a natural diet for a large dog. Why We Like It – Not all Great Danes will or can eat kibble; either due to preferences or mouth- or teeth problems, and this soft food for Great Danes and other large breed dogs is a solution that still provides them with all the nutrients they need to thrive. See more cheap dog foods here. So, now that we have had a look at some quality dog food products, what is the best dog food for Great Danes? How much to feed Great Dane puppies and what is the best food for Great Dane puppy members of the family? It can seem a bit confusing when trying to figure out what to do about feeding Great Dane puppy dogs or how to give your adult Scooby Doo look-a-like what he or she needs to stay healthy for as long as possible, but it is not rocket science. Big dogs have some other, or at least different, nutritional needs in comparison to small dogs (see dog foods for small dogs here), but the foundation is the same. To thrive, a Great Dane needs love, care, nutritious food, and regular veterinary check-ups, so let’s start by having a look at what you want to keep an eye out for when choosing a kibble or wet food for your Dane. And, before you start asking yourself “How much should I feed my Great Dane?” – Consider what you plan to feed him or her since the nutritional content decides the amount that should be distributed and fed. When buying food for your Great Dane, you want to pay attention to the ingredients (make sure meat is listed high), bone and joint supplements such as Glucosamine and Chondroitin, the food should have added vitamins and minerals, and if you can find a product with natural ingredients – don’t hesitate. Natural food is good for both people and dogs, and remember to stay clear of artificial colors, flavors, and preservatives. Like all dogs, Great Danes need protein in their diet. Protein helps keep the body strong, the inner organs functioning normally, it promotes an even energy level and a strengthened immune system. In dog food, protein will often come from meat sources, so you want to make sure that the food you feed your Great Dane has good levels of quality meat. Stay away from animal by-products, as these are not considered quality meat sources, as well as unnamed meat products where the type of meat is not specified. Check the ingredients’ list to establish that one- or several of the 1st, 2nd and 3rd ingredients listed are meat or meat meals (chicken, turkey, lamb, beef, or chicken meal, turkey meal and similar), which are all considered high-quality and protein-rich meat sources. These supplements help promote bone and joint health, and for large breed dogs like the Great Dane – this is essential. Their weight puts a lot of stress on their bones, and GD owners need to start preventing disease and pain already from the start. Glucosamine and Chondroitin sulfate are found naturally in the body, as a component in the cartilage. They are both fundamental in keeping the joints oiled up and moving effortlessly, and in strengthening the bone itself. With age, the production of Glucosamine and Chondroitin tends to slow down, which is why supplements might become necessary. For Great Danes, however, there is no need to waste time and wait for them to reach a senior age, but instead, it is a good idea to give them dog food with extra Glucosamine and Chondroitin already from the start. Large dogs have different needs than small dogs, and you might have heard to be careful when using puppy formulas for large breed dogs since it can cause them to grow too fast, which in turn puts too much pressure on their developing bones and joints. 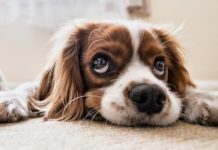 This is why you should always choose a puppy food made for large breed dogs since these are adapted and formulated to stop this from happening, and to instead provide the puppy with exactly the right nutrients. The best food to feed Great Dane puppy friends is a kibble or wet food made for large breed dogs, as a Great Dane puppy diet needs to be balanced and complete. It can be hard to know how much to feed a Great Dane puppy, but this is also extremely important to avoid over- or underfeeding, and it is recommended to always follow the Great Dane puppy feeding chart printed on the product you purchase, as well as Great Dane puppy food recommendations. Another reason for choosing a dog food for large breeds is the size of the kibble. “How much food does a Great Dane eat” is probably a question that has passed through your mind at some point, but have you ever thought about the importance of kibble size? 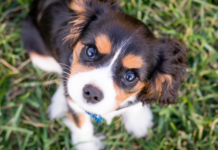 The right size will help keep your pup’s teeth clean, and they will gently massage the gum as they chew; helping to prevent gum disease and fighting off tartar. 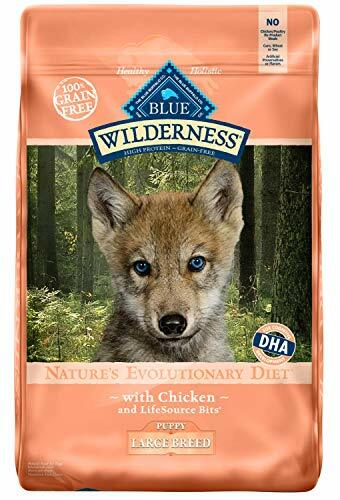 The best dog food for Great Dane puppies is one that helps them grow at a good rate – not too fast and not too slow – and ‘Blue Buffalo Wilderness High Protein Grain Free’ is a quality option worth checking out. It is grain-free and uses natural ingredients, and Blue Buffalo also has an adult variety that you can switch to once the dog is old enough. 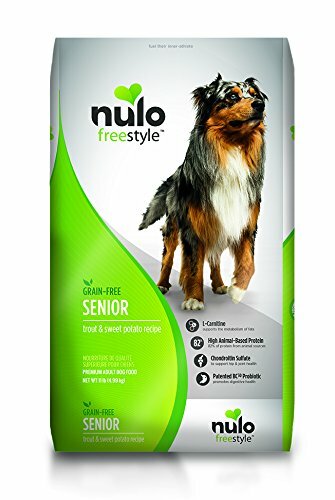 The ‘Nulo Senior Grain-Free Dog Food with Glucosamine and Chondroitin’ is a dry dog food for senior dogs that has everything that is needed to care for a Great Dane that is starting to get older. It has Chondroitin and Glucosamine for bone and joint health, it is made with 80% animal protein and has no artificial color, flavor or preservatives. 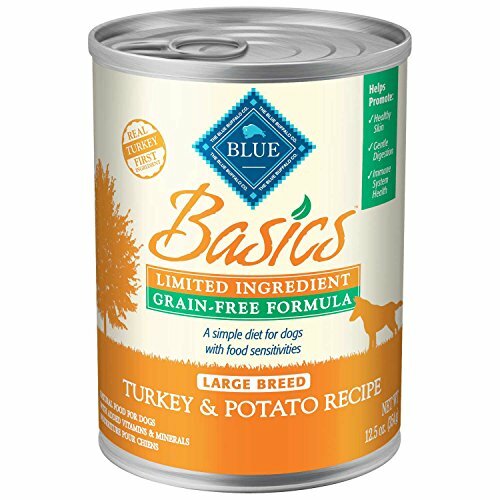 Have a look at the ‘Blue Buffalo Blue Basics Lid & Grain Free Large Breed Turkey Canned’ – a wet and mild formula for large breed dogs. 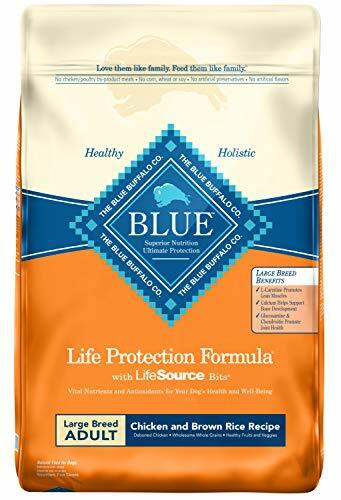 Blue Buffalo is known for making high-quality dog food, and this mushy and meaty treat can be given to the dog as a full meal, or it can be mixed with kibble to make breakfast or dinner more appealing. This is highly individual since all dogs are different. Some have preferences, others are sensitive to certain ingredients and so on, but a good option to try is ‘Natural Balance Limited Ingredient Diets’. It is a dog food made to suit large breed dogs, with limited ingredients which are perfect for sensitive stomachs and dogs with allergies. Some Great Danes suffer from skin allergies, and this formula is made with high-protein lamb that is considered a mild and gentle meat source. It is impossible not to love a Great Dane, and while they will sometimes eat just about anything you offer to them – it is important for such a large and majestic dog to get proper nutrition. Their bodies need strength to carry their own weight, and their bones and joints need to be cared for already from the start. Finding the right Great Dane dog food will allow you to relax with the knowledge of having done what is best for your furry friend; something that will give you many great years together and keep your buddy happy and content at the same time. Be prepared to be patient when looking for the perfect dog food for your Great Dane, since it can sometimes take a couple of tries before you find the right one. Every dog is different, and what works for one might not work for another. If your Dane does not seem thrilled about the food you choose, just give it some time first, and if nothing changes – try a different dog food. 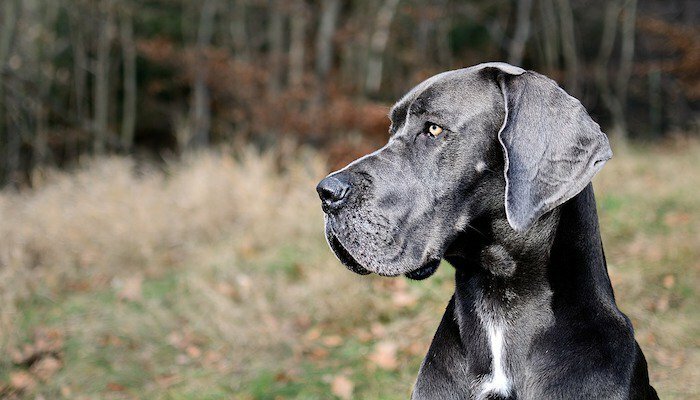 Even though the breed is called a ‘Great Dane’, the breed isn’t actually Danish. It was originally developed in Germany.